Safety is our number one priority. IMMEC has a comprehensive safety program that addresses hazardous material, confined space, hot work, fall protection, lock out/tag out, and many more health, safety and environmental related policies and procedures. 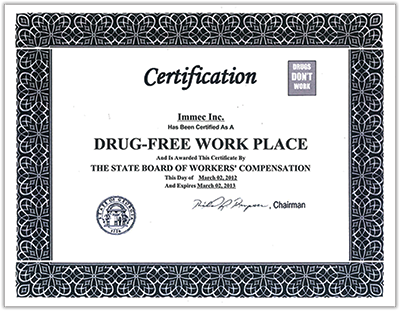 IMMEC is a Drug-Free Work Place holding a Certification with the State Board of Workers Compensation. 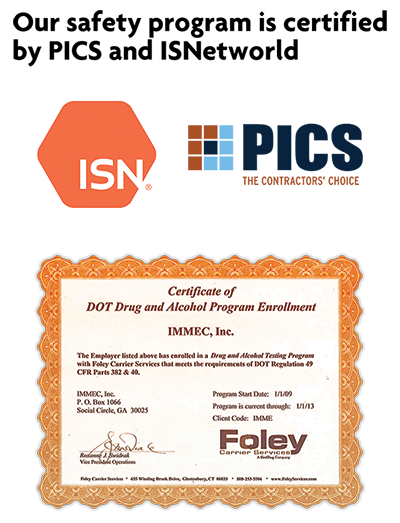 Our company maintains a DOT approved drug testing program, In which all team members are drug tested upon hire or re-hire and are included in the company's random testing program. Our subcontractors' adherence to these policies and procedures insures us that our customers maintain a safe and skillful work force. Our goals are to provide a safe and productive work site at all times. Our team is trained in Job Safety Analysis (JSA); Near Miss Reporting and Safety Observations. We provide annual safety training and refresher training on an ongoing basis which encompasses best practices and lessons learned. We are dedicated to elevating the standards for safety in the construction industry through a wide variety of methods—from zero-tolerance drug testing to our aggressive fall-protection program. Through innovative training and education programs, we also provide our employees and subcontractors with the tools, knowledge and resources they need to increase safety, reduce risk and improve loss control on every project we manage.